Hong Kong is a place like no other. It has the hustle and bustle of Manhattan (though even more crowded, imagine that), a top notch food scene, high-end designer stores and cool quirky shops, and so. much. more. 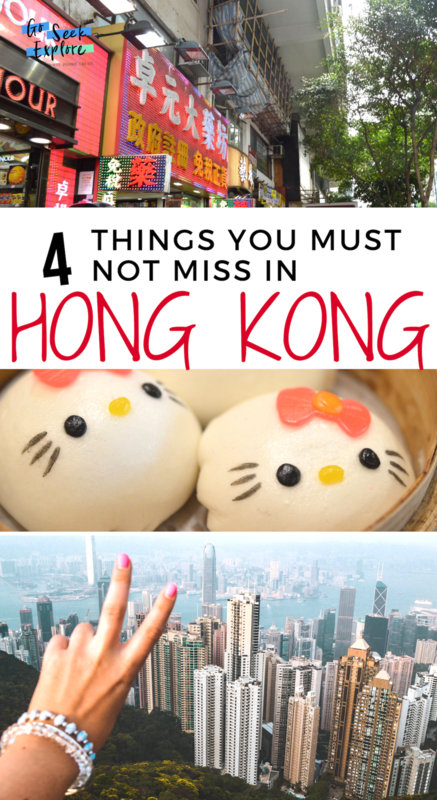 There are many things to do in Hong Kong, but here are four simple things I highly recommend you do on your trip. Every evening at 8:00 pm, there is a magnificent light show on the skyline along the water. Since both the Kowloon side and Hong Kong Island side have skyscrapers and buildings, you can enjoy the show from either side. You can simply walk down to the water and enjoy the view. However, if you prefer, you can find a restaurant or hotel that for another vantage point where you can enjoy a drink or food while you watch the show. I stayed at the Sheraton and went up to the restaurant at the top for dinner while watching the show out the window. They switched the regular music to the light show music so you could hear it clearly inside. Chances are you’re either staying in Kowloon or on Hong Kong Island, and since both have plenty to offer, it would be a shame to only stick to one side. It only costs $2 HKD to take the Star Ferry ride from Tsim Sha Tsui to Central on weekdays and $3.40 HKD for weekends and holidays. The lines and process to get up to the peak are long but are worth the wait. The view of Hong Kong from above is incredible! Make sure that when you purchase your ticket for entry, that you also pay to go up to the very top. (There are plenty of shops inside the building before you go up to the top). Hong Kong is known for its delicious, and sometimes quirky, food. There will be no shortage of amazing culinary experiences on your trip! As for the “fun” foods, I especially enjoyed bubble waffle ice cream and Hello Kitty shaped dumplings. Make sure to try multiple restaurants and a variety of food on your trip to Hong Kong. You won’t be disappointed!